We have been working on the steem-bounty app over the last few weeks and while we are still not ready to launch it yet fully, the basic functionality of the bounty is working well enough that risky users may try it out as of now. We are working on a UI and until that is ready, we think that the usability more exiting and useful. The website should be ready in about 2 months if our plans hold up. In the mean time we wanted to explain with this post how bounties work and how you can use them if you like even without the fancy frontend. While we have tested the workings, please be aware that this is a beta version of the functionality and your bounty may not work 100% as intended. Should any issues arise we will try to correct it, but please be aware that this may not always be possible. Creating a bounty is very simple. 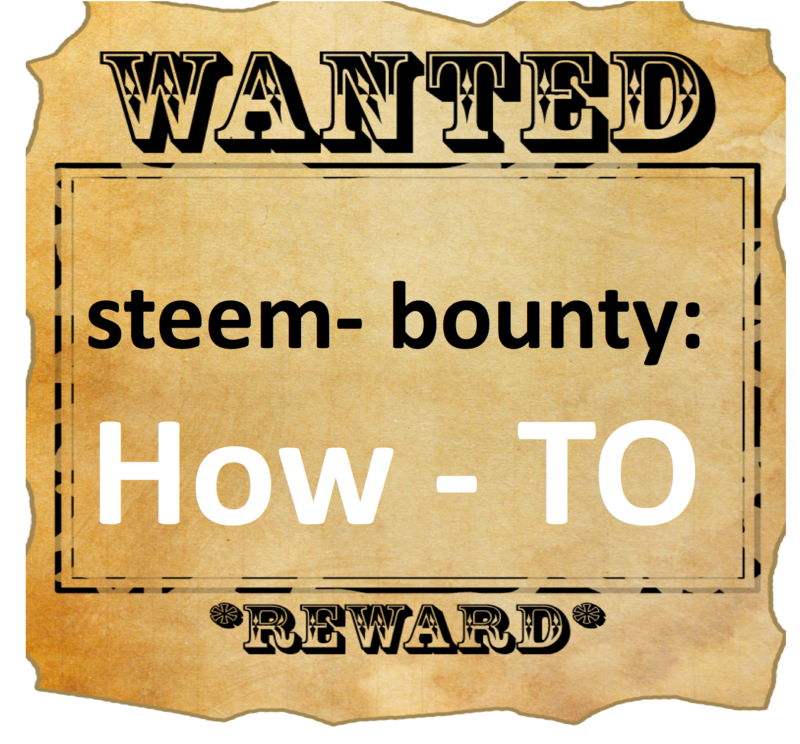 All you have to do is send any amount in steem or SBD to the "steem-bounty" account with the post URL that shall receive the bounty. In other words anyone can put a bounty on any post provided it has not been paid out yet. Once you have send the funds to a valid post, steem-bounty will setup the bounty for you and write a corresponding comment to the post. If that did not work for any reasons steem-bounty will send the funds back to you. How to vote for the winners? Any comment submitted to the post with the bounty is considered eligible for the bounty payout. Which comments receives how much depends on the votes the comments received. But not all votes are created equal. 80% of the bounty is distributed according to the votes from the bounty creator. If the creator votes for more than one comments the relative %-age of the vote determines the distribution. In other words, bounty creators vote with their %-age sliders. This is to allow the bounty creator to disperse most of the bounty and give him or her a very simple way to select how much to give to each contributor. 20% or the rest of the bounty is determined by votes of everyone else that voted on the comments. The weight of each vote is hereby determined via the "rshares" or the effective vote values as they are displayed by steemit (those $ amounts you see next to the votes). If only the bounty creator fails to vote, the community votes determine the entire bounty and vice versa. If no votes exist the bounty will be re-funded. 7 days after the creation of the post (not of the bounty) steem-bounty will tally all the votes and pay out each comment that received so much votes that its creator would at least get 0.001 Steem or SBD depending of the currency of the bounty. 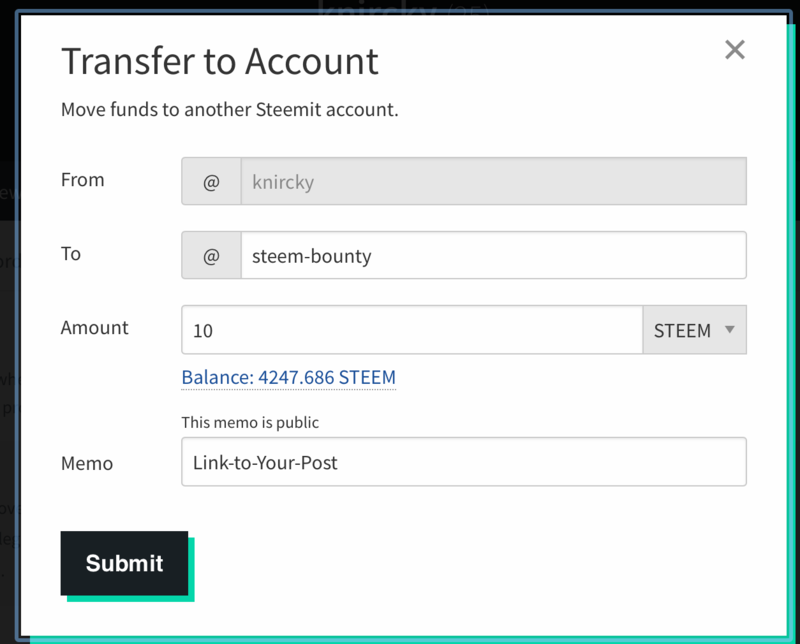 Steem-bounty will also provide a corresponding memo and post under the winning comment. We currently have a simple fee structure where we keep a few % of the overall bounty. We are going to implement better fee structures that allow us to offer the service without taking away from the bounty directly. Those will be released with future version. We suggest you use the "bounty" or "steem-bounty" tag in your post. This will allow others to find post easily and for us to promote your post. Since we do not have a website yet, make sure to mention the bounty in your post of better yet in your headline. This will get you extra attention from users. So the basic functionality is working and we would be delighted if you used it. We think the biggest way to make an impact is to provide a way to find bounty post very easily. This is why we are working on a website that will make it easy for bounty hunters to find bounty post, which should then also make it more rewarding for folks that post the bounties. In the meantime feel free to use this functionality or wait until the next version will come out which will have a lot more useful features.